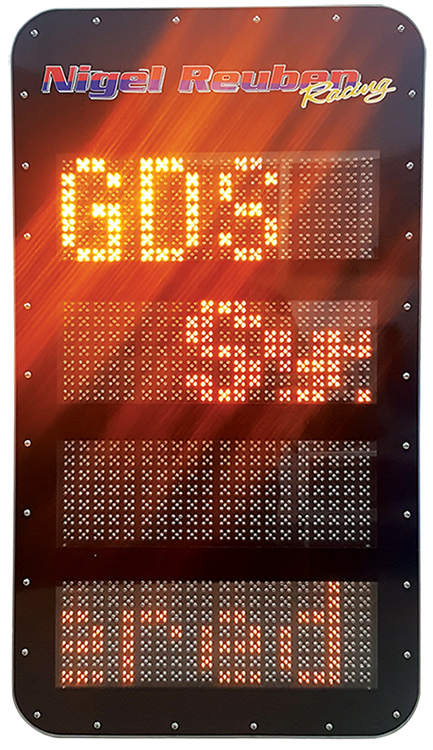 The GDS Electronic Timing Board has been developed over a period of time taking into account the rules and regulations by such bodies as the FIA, ACO and IMSA. We often get asked if we can change the colour of the LEDs, but there are two main reasons why we cannot do this. The first is that the various governing bodies will not allow us to do so and secondly, after years of testing, developing and live usage, we know that the colour of the LED is the best one for drivers to see at 160mph +. Unless you are a team that races at night, the question that we also often get asked is why do I need one for the daytime? Again, through extensive testing, the GDS timing board has demonstrated that our board is actually a lot clearer to read than a hand held device. The brightness level can be controlled from the laptop. We only carry a limited amount in stock avalable for hire.